Ethiopian Opposition Leader's Release: For Show? 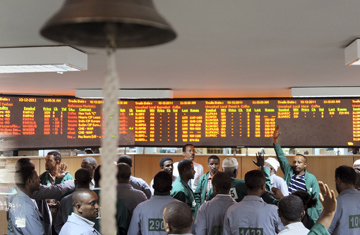 It's a slow day on the Ethiopia Commodity Exchange, so the dealers are trading stories instead. "I love the money, and I love the atmosphere," says sesame and coffee dealer Takele Chemeda, 38, surveying the octagonal trading pit and the giant screens hanging from the ceiling. "What happens on the floor stays on the floor, you know? After a big session, we all go out and party." At 43, sesame trader Stemsu Abdella worries about how much longer he can take the pace. "What do you see on my face? That's stress, man, stress." Inevitably, talk turns to sesame buyer Belayneh Kinde, the exchange's most legendary trader. Says floor manager Fekadu Berta: "He buys five, maybe six million dollars a session. He knows what's happening and what's going to happen. The guy came from a really poor family. He just bought a hotel." To those who think of Ethiopia primarily as a place of hunger, the idea that the country's first yuppies are food traders will come as a surprise. But much has changed in the quarter-century since Live Aid. A nation that was once the focus of a multimillion-dollar famine-relief effort is now home to a trading floor  the Ethiopia Commodity Exchange (ECX)  that sold $1 billion in coffee, sesame, wheat, maize, peas and haricot beans last year. The change is emblematic of a much broader transition taking place across Africa: the evolution from subsistence to commercial agriculture. The implications for the continent are radical. Seven out of 10 Africans live off the land. Commercializing agriculture  increasing the scale and profitability of farming  would spur meaningful participation in an economy, often for the first time, by 700 million people. Moving from subsistence farming to more competitive, scalable agriculture could spell the end of chronic poverty on the continent. Studies by the International Food Policy Research Institute and the World Bank suggest that every 1% rise in agricultural income per capita reduces the number of people in extreme poverty by 0.6% to 1.8%. Moreover, while aid agencies warn that high food prices fall hardest on the poor, high prices only sharpen the opportunity for Africa's farmers  if they can manage to hold on to enough of the profits. "This is huge," says ECX chief executive officer Eleni Gabre-Madhin. "This is catalytic. It affects millions. It touches every part of the economy." The world has had agricultural revolutions before, and their effects can be profound. The domestication of plants and animals 13,000 years ago was a prerequisite for civilization. In 16th century Britain, enclosure, mechanization, crop rotation and selective breeding produced the surplus and the spare workforce that drove the Industrial Revolution. India's Green Revolution, which introduced irrigation, fertilizer, pesticide and high-yield seeds in the late 1960s and the 1970s, ended widespread famine in that country and turned it into a rice exporter. Now it is Africa's turn. The continent's economies are based on industrial commodities: gold, oil and gas, diamonds, minerals and timber. But much of the wealth from these sectors, which are capital- but not always labor-intensive, has gone to corrupt governments or multinational companies rather than Africans. Food could be different. With just a bit more capital, better infrastructure, technological help in the form of things like exchanges that create larger markets, and better planning around development and aid, farmers could cash in. Certainly, growing global demand is on their side. Just as higher oil prices have made exploration of difficult-to-extract reserves in Siberia and the deepest oceans economically viable, so sharply rising food prices are making African agriculture look more attractive. Global food prices are up 50% in the past two years, and the World Bank has projected that global food demand will jump by half in 20 years, ensuring they will remain high. Those projections have resulted in a land rush around the world, especially in Africa, home to 45%, or 200 million hectares, of the earth's uncultivated land  enough to increase global farmland by 13%. Until 2008, agricultural land was being bought at an annual global rate of 4 million hectares, according to a World Bank report this year. In 2009, that rocketed: deals for 56 million hectares were announced, including 29 million hectares in sub-Saharan Africa. From 2004 to 2009, Ethiopia sold 1.2 million hectares, Mozambique 2.7 million hectares and Sudan 4 million hectares. The buyers tend to be from high-growth countries that are running out of their own land, like China, India, South Korea and Saudi Arabia. One vision of Africa's farming future can already be seen up and down the Great Rift Valley in Kenya and Ethiopia, where hundreds of translucent polyethylene tunnels are joined to form giant indoor farms. Inside are hundreds of square kilometers of vegetables and flowers. Some of those farms are foreign-managed; some are run by locals and have contracts with foreign food and flower exporters. Each year, Ethiopia exports $60 million in fruit and vegetables and $160 million in flowers, up from nothing 15 years ago. Neighboring Kenya, where the agricultural-trade industry is older, exports three times as much. That autumnal asparagus, those extraordinary midwinter roses at your local supermarket? They're likely from Africa. See pictures of China's investments in Africa. See Alex Perry's coverage of Africa.